The Boo Mason Junior Tennis Program at Boo Mason Tennis is second to none. Our award winning Junior Development Program has been going strong for 25 years. 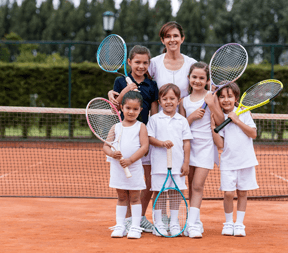 Boo Mason has been involved in working with young tennis players in every capacity, from beginners in 10 and under tennis to working with college players. The program involves weekly tennis clinics, private lessons, specialty camps, Jr. Team Tennis and tournament play. We teach winning the right way. We don’t concentrate on winning for the “sake of winning,” but on skill development. All our instructors are well trained and are focused on where your child is and on getting them to reach their full potential. We do specialty camps throughout the year to focus on specific aspects of tennis. Camps are great ways to get kids to concentrate on their game for an extended length of time. This next year we will do: Jr. High tryout camps, doubles camps, serving camps, holiday camps (during Thanksgiving, Christmas and Spring Break). We do FCA (Fellowship of Christian Athletes) to teach kids a Biblical perspective on winning. All the camps are fun and organized for a specific need. Boo Mason Tennis runs the tennis shop at Boo Mason Tennis and is a full service tennis store. We sell racquets, clothes, shoes and accessories. We also string racquets. Our stringer, Jeff Peters, is one of the best in Birmingham and we have a state of the art stringing machine. We specialize in being able to get things other shops can’t find. League play is run out of Boo Mason Tennis and Wald Park. If league tennis is your thing we can meet your need. We have every kind of tennis league possible. We have softcourt leagues, LITL leagues, flex leagues, USTA leagues (Senior, 18 and over and 40 and over). 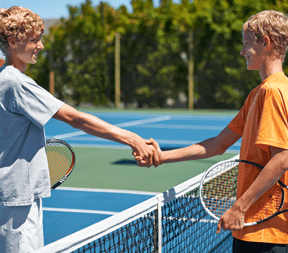 We have started the Tennis Apprentice program that leads you right into beginner leagues. We have leagues for men, women and mixed. To plat at Hoover Country Club you must be a member. To play at Wald Park there is a season fee. Talk to us and let us show you how to get involved. Boo Mason Tennis also runs the tennis program at Wald Park as a part of the Vestavia Hills Park and Recreation. 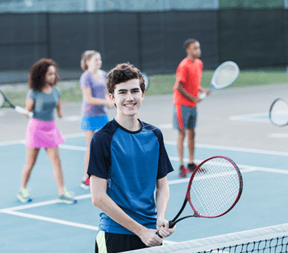 Wald park offers a full line of tennis instruction for men, women, and kids.